It’s the start of the fall sports season, which means more kids are going to be sidelined by concussions. Many of those will recover without much suffering. But others will go on to experience persistent concussion symptoms (called post-concussion syndrome or PCS). These students may be even be classified as experiencing a mild traumatic brain injury (mTBI). Student athletes who experience ongoing concussion related symptoms sometimes fall through the cracks. Some are forced to give up their season. Some begin having learning and social problems in school. And some will continue to have concussion related issues even though they follow up with some of the best care they can get in concussion related treatment. 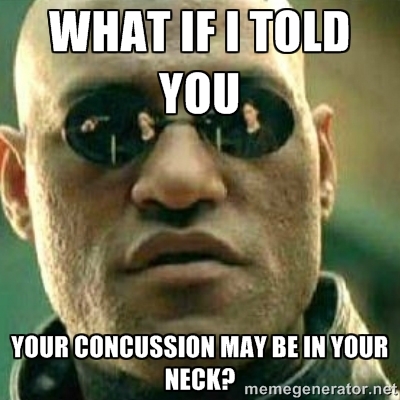 Unfortunately, persistent concussion cases often have an underlying neck injury. Complete healing may be very slow in coming without dealing with the neck injury either first, or in conjunction with other forms care. A very brief summary of the video is this: whiplash – or cervical acceleration/deceleration injuries- are a recognized source of concussion. But sometimes this whiplash injury is forgotten or overlooked in everyone’s concern about the potential damage to the brain (mTBI.) The video above explains it in detail. A good example of the situation above is the story of a college football player named Conner DeChant.I personally interviewed Conner when I was writing the patient healing stories for the National Upper Cervical Chiropractic Association newsletter. Conner’s experience isn’t the classic concussion story. The classic concussion story usually starts with a strike to the head, followed by the victim being dazed and disoriented. Some may even find themselves stumbling around unable to move in a coordinated way. Mood swings and nausea and vomiting may come next. But not every athlete experiences that “one big hit” which makes them see stars and causes their coach to pull them from the game. So Conner’s story is not unusual. Milder concussion-like symptoms can show up over a period of days and weeks and not really be recognized as a possible concussion until the athlete is evaluated for a mild brain injury. Luckily, Conner’s trainer was smart enough to give Conner a few tests that helped identify his concussion since he developed them over a series of week. As it happens Conner’s mother was a holistically oriented personal trainer, who had colleagues that were trained to look for signs of neck and upper neck injury. They told Conner’s mom to take Conner for some upper cervical chiropractic care. Perhaps one of my favorite cases as a chiropractor involves a patient with a number of health problems that were all complicated by a mild traumatic brain injury. It is detailed on the before and after section of this website. Though some of his chronic pain his preceded his head injury, many of his problems got worse after 2007, when a steel beam hit in the head at work. He was working on all fours, and was struck in the left with enough force to knock him upright. After “walking off” his head injury, his memory, balance, and depth perception began to fail later in the day. With the addition of his speech becoming slurred he was diagnosed with a traumatic brain injury. This man’s persistent headaches, neck pain, poor sleep and visual disturbances are very similar to the symptoms experienced in a post-concussion syndrome. Brain damage from his head injury was verified by his doctors. But the issues created by the neck injury that happened at the same time as his head injury were never fully corrected. And that exacerbated his existing problems (chronic pain) while creating some new ones. 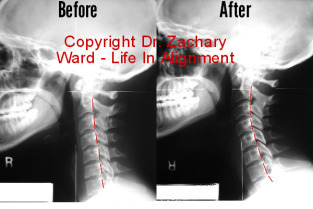 Correcting the alignment of his neck gave his body a new opportunity to heal even though he was five years out from his head injury. How did he respond to improving the mechanics of this neck? What’s the take away for post-concussion syndrome patients? Anyone struggling with symptoms persisting after a concussion deserves to have an evaluation by an expert in the evaluation and correction of neck mechanics – even if that head injury was years ago. Anyone who has recently experienced a concussion (mild head injury) should consider an upper cervical evaluation for whiplash, even without the development of symptoms. For many that will come in the form of an upper cervical chiropractor. 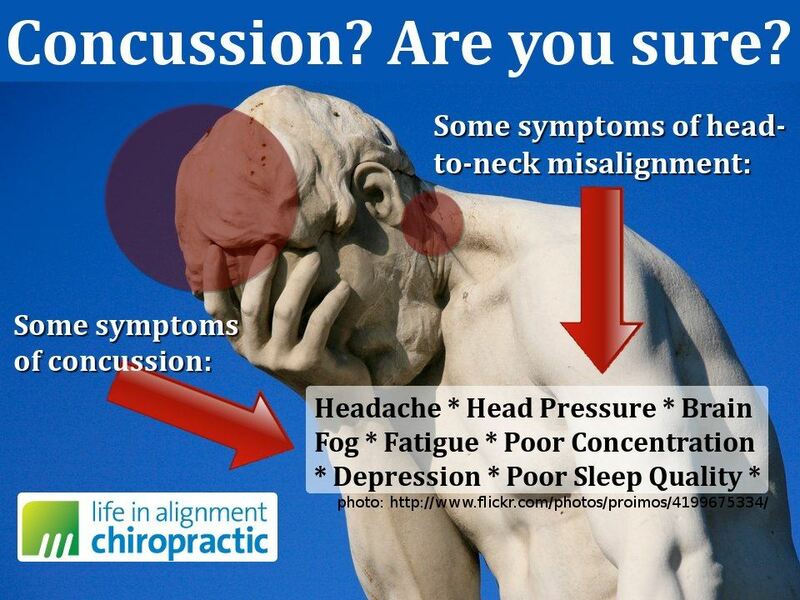 Looking for a second opinion or your post-concussion student athlete? Use the contact form. Detroit-Metro locals can call (248) 598-4002.